These ten top Broadway tunes will satisfy every student's Boomwhacker urge! 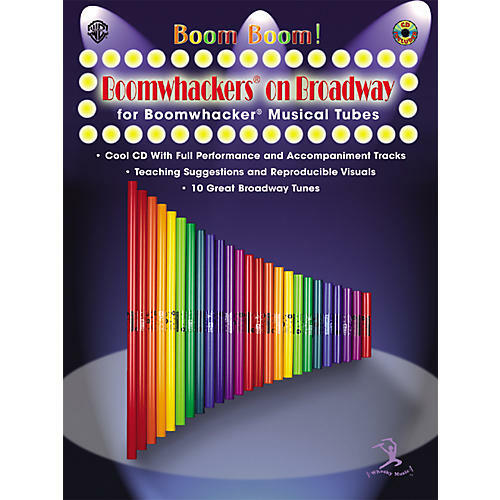 Alfred's Boomwhackers on Broadway gives you the 10 top Broadway tunes guaranteed to bring a smile to the face of kids and parents alike. Includes CD, teaching guide, and visuals to aid learning and performance. The play-along CD offers full performance, Boomwhacker music, and accompaniment tracks for songs such as "I Don't Need Anything but You" (Annie), "Big Spender" (Sweet Charity), "Applause" (Applause), "Aquarius" (Hair), and more!